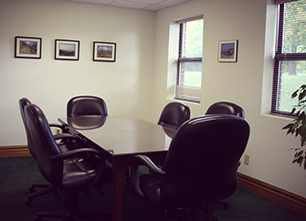 We offer both large and small conference room rental at the hub of Northwest Indiana for a variety of meeting types. 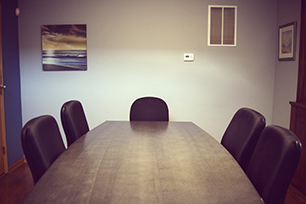 Attorney/client meeting suite with complimentary wifi and ancillary services. 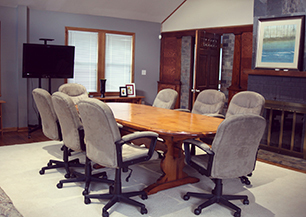 Meet with your client in a private suite and let BOSS Reporters take care of your requests from copying to catering. BOSS Reporters is located two miles from all major highways in Northwest Indiana and only eight miles east of the Gary/Chicago International Airport; I65, the Skyway, I94, and the South Shore Train Station is steps from our door. Make BOSS Reporters your virtual office for conducting your business in Northwest Indiana. Small conference rooms seating 6 to 8 people. Large-capacity meeting room seating 14 (or more) with a private breakout room and a snack and beverage center.